This is the new Ford Ka Concept, but don’t let that fool you. This is a thinly veiled production version of the long-awaited replacement for the firm’s cheap, small car. Set to launch in 2016, it has popular shoes to full. The Ka has sold in droves, logging 1.8 million sales since it was introduced back in 1996. Gone are the ‘cutsie’ looks of the previous Ka, replaced with lines and styling features that look tremendously familiar to anyone who has seen a recent Fiesta. Let’s be honest, that means you. 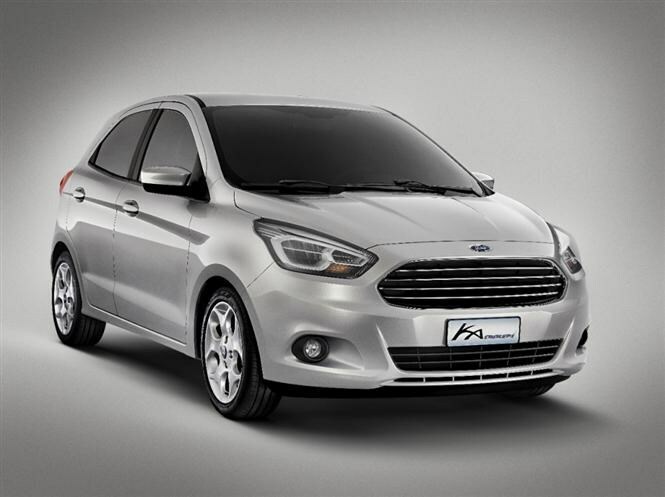 The Ford family face features the now-familiar Aston Martin-esque front grille, while the wheels on the concept look very similar to those on the Fiesta’s most popular trim level – Zetec. Ford claims the Ka will seat five ‘comfortably’, which means some extremely clever packaging and perhaps even some witchcraft has been brought into play. As with most new cars these days, technology is going to feature heavily. The new Ka is ‘connected’, by which we mean it’s capable of connecting to your smartphone or sat-nav system directly. It’ll also feature Ford’s SYNC voice-controlled multimedia system along with APPLINK, which will activate smartphone apps while allowing the driver to keep their eyes on the road and hands on the wheel. While there’s no word on engines at this point, we suspect there won’t be a diesel offering. This is a mantra other firms are using with their small cars – think Hyundai i10 – as diesel simply doesn’t make sense in this marketplace. What we do expect is the fitment of Ford’s 1.0-litre EcoBoost petrol engine. It’s found its way into pretty much all and sundry in the Ford range so far, powering everything from the Fiesta to some of the firm’s vans. Thanks to its turbocharged, three-cylinder lightweight set-up it’s capable of providing very good fuel economy and low CO2 emissions – which means low tax, and hence happy drivers. The question is, can the new Ka really hope to take on the might of the platform-sharing Volkswagen Up, SEAT Mii and Skoda Citigo? What about the five-star Hyundai i10? Parkers will be among the first to drive this all-new model. Keep an eye out for our full Ford Ka review to find out what it’s like.